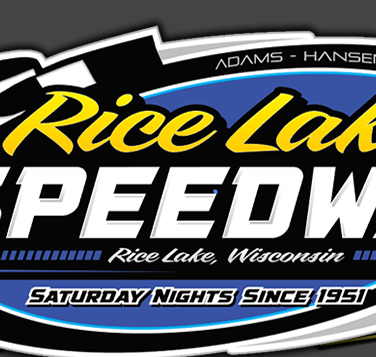 Rice Lake WI, May 7 – Three more new winners emerged in racing action Saturday night at the Rice Lake Speedway as the track was able to complete its fourth race of the year without any weather issues. Ryan Viltz came from the fourth row to top the biggest individual field of the year, thirty two Midwest Modifieds, for his first win on the year and was joined as a new winner by Mike Anderson and George Richards. Hunter Van Gilder, meanwhile, won his second Street Stock feature of the year here and Curt Myers, with his first Super Stock win of the year to go along with two Midwest Modified wins earlier this year, becomes the top winner at the speedway to this point. 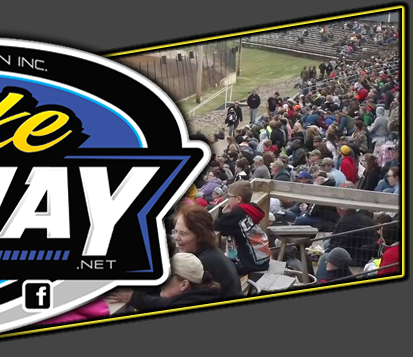 The largest field of the year, ninety nine cars, signed in to race on Saturday night. Nineteen cars took Shaun Cimfl's green flag for the Midwest Modified main event with Bryce Johnson and Austin Ellis battling briefly before Ellis secured the top spot. Austin was immediately challenged for that top spot by Grant Southworth and a fast moving Michael Truscott. Viltz, meanwhile, shot to the high side of the track and quickly moved up from his seventh starting spot. In one of the most spectacular moves of the season to date, Viltz got a great run off turn four and squeezed past both Truscott and Southworth down the front chute and shot into the second spot. He then continued to work the high side and blew past Ellis to take over the lead, an advantage that he quickly built upon. Meanwhile, Truscott slipped under Ellis to take over second with Southworth motored past Ellis also as both tried to track down Viltz. The lone yellow and the only car not to finish the event was Tanner Byholm who spun with seven laps complete and called it a night. Viltz continued to work the high side with Truscott and Southworth restarting right behind him and Ryan was gradually able to extend his lead over those two. Charging up through the pack was Shane Halopka and Joe Chaplin Jr as they fought to get into the top five. Halopka moved past Ellis for a position with Chaplin Jr. also doing so. Viltz was not pressed the rest of the event as he continued to work the high side and drive on for the win. Truscott finished a strong second to back up last week's win here with Southworth following. Chaplin Jr. continued his late race charge as he drove past Halopka to take the fourth spot on the final lap. Tim McMann led the opening laps of the Modified main event, a race that would go green to checkered without a single slow down. McMann worked the low side of the track as he edged past Pat Hoffman early and then soon was pressured by Mike Anderson for the lead. Anderson tried the inside but when that line was blocked, he moved to the higher side of McMann and drove past him in turn three to take over the top spot. Anderson started to pull away as McMann was soon challenged by another Anderson, this one Ashley. Coming from the third row, Ashley also moved to the higher line and gradually closed on McMann for second, also making his pass in turn three. Ashley then set out after Mike as Andersons dominated the front of the pack. Cory Mahder was also on the move after starting in row four and he to closed on McMann. Ashley Anderson started to close up gradually on Mike, but without the assistance of a yellow flag to bunch up the field, the distance was just too much to cut and Mike, who continued to run a smooth race, drove home for the win, with Ashley several car lengths behind in second. Mahder got past McMann for third in the last going and Hoffman had another good run to complete the top five. After a first lap spin by Rob Holmstrom Jr the Pure Stocks ran green to checkered with George Richards stopping Jason Havel's win streak at three in a row. Actually, for most of the race it looked like youngster Alex Smith was going to take his first ever career win at Rice Lake until late in the contest things took a bad turn for him. Smith started on the pole and had a great battle in the early going with Tucker Quinn before assuming the top spot. Smith gradually extended his lead to several car lengths as Quinn was being challenged by Richards and Havel for second. Havel, who started ninth in the field due to his three straight wins, took some time to get through the pack but he soon was moving his way toward the front. Smith had built up a nice sized lead but once Richards cleared to the second spot, he began to methodically move in on Smith who soon began to feel the pressure as Richards closed. Smith slid a little high and Richards closed right up behind him. Then Smith again slipped high out of turn four and banged into the wall hard with Richards ducking under him to take over the lead. Smith tried to charge back but he pounded the back stretch wall even harder when he got to high and he damaged his race car, but was able to slow and limp off the track without triggering a yellow. This moved Havel into second and he set off after the new leader. However, Richards worked lapped traffic well and while Havel was able to close to within three car lengths on the last lap, George drove home for his first win of the year here. Havel settled for second after having won the first three features of the season and Joel Hinrichs made a nice run to finish third. Quinn settled for fourth and Randy Graham had another solid run to complete the top five. The Street Stock feature was a two car battle all the way with Van Gilder holding off Cody Kummer to take his second win of the year at Rice Lake. In the early going Kolby Kiehl and Ryan Glembin raced side by side for the lead with each sharing the top spot at some point during the initial laps. Van Gilder and Kummer were right behind the lead duo and when the openings broke, Van Gilder was in the right spot at the right time and shot past Kiehl to take over the lead. Kummer quickly followed suit and the battle for the lead was on. Van Gilder showed the way but Kummer was literally right on Hunter's rear bumper as he probed for an opening, attempting to try both high and slip under the low side. However, Van Gilder remained in the groove and Kummer couldn't muster enough speed to slip past. With three laps to go, a spin triggered the first yellow of the race and bunched the field. This was Kummer's chance but Van Gilder got away quickly on the green and in the remaining three laps Kummer couldn't muster a charge as Van Gilder took his second victory of the season. Glembin and Kiehl continued their nearly race long battle and in the end, Glembin took his best finish ever at Rice lake with a strong third place showing with Kiehl right behind him. Kevin Bogdanovic recovered from a late spin to charge back up and complete the top five. While the other four feature races had a combined four yellow flags, the Super Stock main had a mind boggling nine yellow flags before the race shortened event could be completed. While Myers found the lead early and remained relatively unchallenged, the number of twists and turns among the other contending cars was stunning. John Erickson sat on the pole with Terran Spacek to his outside and they raced side by side on the opening lap. However, Myers was right behind Erickson and he found an opening on the low side and shot into the lead early. As Myers extended his advantage, Kevin Burdick and Jeff Klopstein Jr were working their way into a challenging position. Myers had built up a solid lead but when Klopstein Jr got to second, he quickly began to cut into the advantage as he worked the high side of the track. Klopstein Jr had cut into Myer's big lead and was just ready to challenge Curt when Klopstein Jr rolled to a halt, the victim of distributor failure. On the green, Myers again assumed the lead but Burdick and Shane Kisling were arguing about the second spot. In fact, they tangled as they headed into turn three with Kisling banging up against the wall and triggering another yellow. Kisling was restored to his second position but unknown to him, his car had suffered some front end damage and on the green his car shot straight up the track and into the wall hard in turn one, again resulting in another yellow. After this, a series of four more yellow flags flew for various spins. Finally the last couple of laps were successfully completed and Myers, who wasn't challenged at the end, took the checkered for his first Super Stock win of the year and third overall. Eric Olson started eleventh and managed to keep his car out of tangles and spins and drove home for the second spot, edging Bart Steffen for that position. Nick Oreskovich spun on lap two, went to the tail and worked his all the way back up to fourth at the end, with Nick Traynor completing the top five in what was the longest feature race of the season. 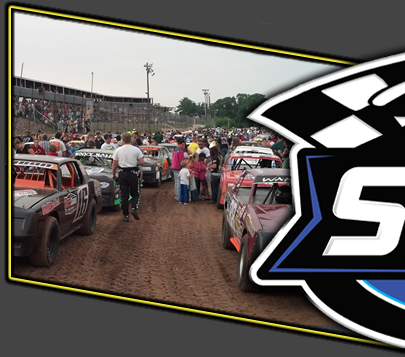 Next Saturday night the racing action will continue with all five classes again slated to take to the track. Warm ups start at 6:30 p.m with racing to follow immediately.